Housed in rectangular brass case painted black, with glass front, rigidly fixed to wooden base with 3 levelling screws. Aluminium pointer includes 3 weights - 28, 84, 333 mg. Comes with mahogany carry case with brass fittings. "Manufacturer's instructions for use of vertical electrostatic voltmeter" pinned to inside of door. 3 ranges: 2500V, 6000V, 12000V. Multicellular type electrostatic voltmeter, i.e. movement is in the plane of the attracted conductor. Probably used to measure voltages for trains/trams. 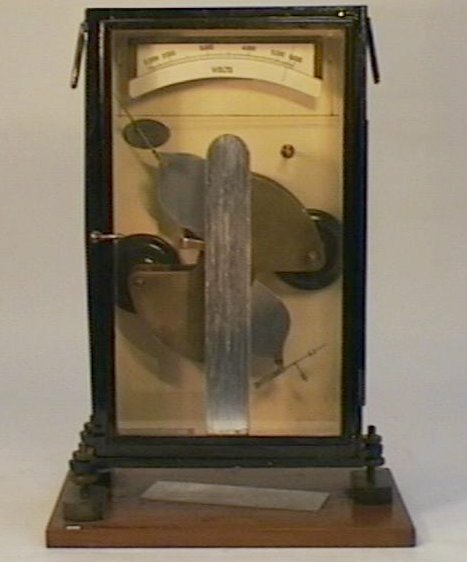 Has the useful property that large surges of power through it will not harm it unlike a galvanometer based voltmeter.